Where will the next generation of conservationists come from? Undoubtedly, most will come from urban areas because that is where most people will be living. In addition, U.S. children are spending less and less time outdoors and nature-based recreation is, in general, declining. We clearly have a challenge. We need to bring conservation to urban areas. That is what is so exciting to me about working in the Detroit River International Wildlife Refuge that has nearly seven million people living within a 45-minute drive. First, the very place the Rouge River caught on fire in 1969 is now located within the acquisition boundary of the Refuge. What a story that the lower Rouge River has gone from burning river to being part of North America’s only international wildlife refuge. Secondly, the Detroit River, like the burning rivers, has a reputation of being a polluted river in the “Rust Belt.” However, much like the burning rivers, the Detroit River has experienced substantial environmental improvement that has laid the foundation for one of the most remarkable ecological recovery stories in North America. The Detroit River has seen the return of bald eagles, peregrine falcons, osprey, lake sturgeon, lake whitefish, walleye, and burrowing mayflies right in the automobile capitals of the U.S. and Canada, and in this almost seven million person major metropolitan area. However, as we all know much remains to be done to fully restore the integrity of the river. But what a revival story and what an opportunity to reach and teach the next generation of conservationists! Urban areas are definitely unique places and ones that most biologists and conservationists have historically shied away from. However, that is where most of the people are and where we can have a significant impact in developing the next generation of conservationists. Urban areas also provide unique opportunities for partnerships and to leverage resources for conservation. Indeed, that is precisely what is happening at the Detroit River International Wildlife Refuge that has worked with over 200 organizations and leveraged over $33 million for conservation projects in its first ten years. 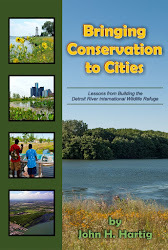 As a result of its work in public-private partnerships for conservation, the Detroit River International Wildlife Refuge was singled out at the 2005 White House Conference on Cooperative Conservation as a model and national leader in building and sustaining partnerships with corporations, nonprofit organizations, conservation groups, communities, and foundations. We need urban refuges and urban conservation initiatives to bring nature into places where people live and to make nature experiences part of everyday life. That is why it is so exciting to see how the U.S. Fish and Wildlife Service has established, through its new vision for the National Wildlife Refuge System called “Conserving the Future,” an Urban Refuge Initiative that defines excellence in existing urban refuges, establishes a framework for creating new urban refuge partnerships, and implements a refuge presence in 10 demographically and geographically varied cities across America by 2015. I encourage you to learn about this new Urban Refuge Initiative and help make it a success. Conservation in urban areas is not a question about the amount and uniqueness of natural resources, it is a question about making nature experiences part of everyday urban life to help develop a conservation ethic. Really, it is a question of human heart. What are the most important things we need to do bring conservation to urban areas? More than 80 percent of Americans live in urban or suburban comminuties, myself included. 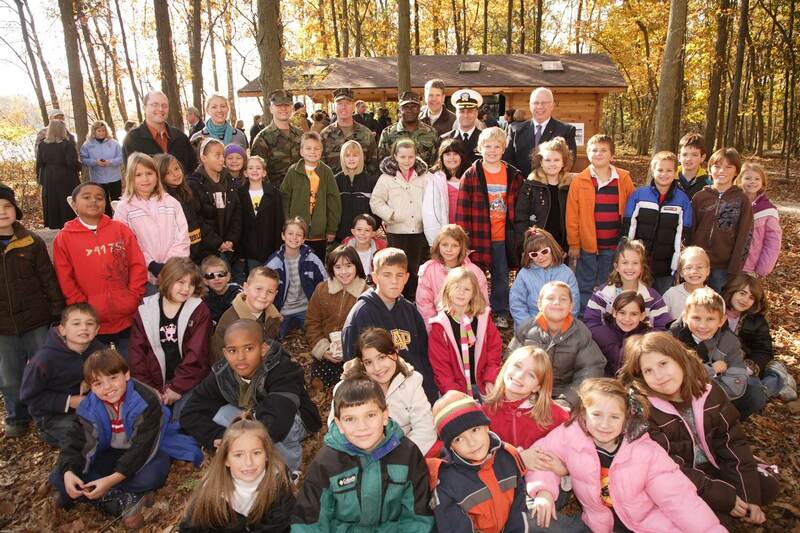 The Service values the role urban refuges play in fish and wildlife conservation and environmental education. Urban refuges help individuals and communities build connections to the natural world and to the important work conducted by the Fish and Wildlife Service.....and help keep us relevant to the American public. 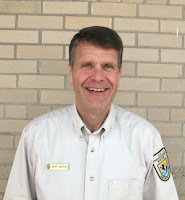 Charlie Wooley, USFWS Deputy Regional Director, Twin Cities, MN. Charlie, I agree fully that urban refuges and urban conservation initiatives help ensure relevancy. Both the Detroit River International Wildlife Refuge and Chicago Wilderness are good examples of how the U.S. Fish and Wildlife Service is strategically becoming more relevant in major urban areas. What needs to be done to better showcase the value and benefits of these successful urban refuge and urban conservation initiatives? The Urban Refuge initiative we describe in Conserving the Future is one of the most exciting and important parts of our vision for the Refuge System. We will convene a summit of the managers of all our existing urban refuges to define new standards of excellence for these existing refuges. We will also work in other urban areas through cooperation and partnerships with parks and nature areas that already exist in cities. We can lend our fish and wildlife management expertise to these partners. A virtual presence through-cutting edge technology must be an element of how we reach into cities. The Urban Refuge implementation team is working hard to make this initiative a reality. Urban areas are great places to work with partners, engage youth and foster citizen stewardship. Urban National Wildlife Refuges, such as the Detroit River International Wildlife Refuge, provide the Fish and Wildlife Service an opportunity to reconnect children with the outdoors through hands-on experiences and technological innovation. Urban areas are where America resides - our communications and interactions in urban areas will be instrumental in delivering future conservation efforts. Urban refuges demonstrate that wonderfully functional ecosystems can exist as small acreages of corridors imbedded in a developed landscape where people live. Likewise, it doesn't take very many acres to reconnect people with the natural world and change lives. I grew up in a big city in a family living the urban life with landmarks being buildings and city streets, where concrete prevails, and the channelized Rouge River. The tiny acreage of natural area owned by the University of Michigan-Dearborn near my house was every bit a wilderness as a kid. Adding to its "wild state" where nature runs unchecked, were effective and inspirational naturalists that encouraged curiousity, and instilled the realization that nature at all scales is profoundly complex,interesting, and worth preserving. Urban refuges are critical to preserving the genetic diversity in populations of fish, wildlife, and plants, so important in long-term conservation. Jim, We are very fortunate that the Service has established the Urban Refuge Initiative to glean best practices from successful urban refuges, work in partnership with urban parks and nature areas to bring conservation to urban areas, and establish a refuge presence in 10 demographically and geographically varied cities by 2015. This will provide many lessons learned and elevate the profile of urban conservation. The important work of the Urban Refuge Implementation Team must be broadly disseminated and must become a catalyst for expanded urban conservation partnerships. Bald eagle, grey fox, Cooper’s hawk, coyote, wild turkey, prothonotary warbler, wood duck, osprey, and river otter are frequently observed on an urban refuge within a few miles of downtown Minneapolis and St. Paul, Minnesota. This special place, Minnesota Valley National Wildlife Refuge, provides habitat for these and many other species of wildlife. Of equal importance, this special place provides visitors of all ages an opportunity to experience wildlife in its natural setting and to rekindle their connection with Mother Nature. All of this was made possible by those with the vision, the energy, and the desire to leave a positive mark on the landscape. John, those of us who have been fortunate to have worked on urban refuges certainly know their value to wildlife and to people. Your hard work and dedication today on behalf of Detroit River International Wildlife Refuge will yield great dividends for today’s citizens of Detroit and for future generations of that metropolitan area. Keep up the good work! Matt, I agree! Urban areas should not be viewed as difficult places to work in the conservation field, they should be viewed as unique opportunities to teach and develop the next generation of conservationists. Greg makes a great point. Functional ecosystems do exist in large urban areas and “wild” is in the eyes of the beholder. Small natural areas can have a very big impact on teaching a conservation ethic to children. Would it be a good idea for the Service and other conservation partners to work with schools to establish small natural areas immediately adjacent to schools to teach conservation and practice stewardship? Cities like Detroit have land to make this a reality. Rick, Minnesota Valley National Wildlife Refuge is a great example of a successful urban refuge. For people living in major urban areas, what are the two or three most important take home messages from the Minnesota Valley experience? What can be done? Many people don’t truly value nature until they visit a refuge and experience the calm, scenic beauty. In this day and age, most people need to be lured into a visit by a program or special event. I purposely exposed my daughters to nature often and it became obvious that seeing a living creature was their favorite part of the visit. They preferred Oakwoods Metropark because after a walk in the woods they could visit the nature center, touch the turtles and see fish & salamanders up close. U of M Dearborn was a favorite because we often saw snakes, rodents, turtles and birds on our walks. And if we didn’t, there was always the cement pond full of frogs. Events with the naturalists there were exciting, one daughter held a wild bird. My daughters learned that a silent, leisurely, walk produced more wildlife sightings. Even a walk on the path along the Frank & Poet drain interested them because the egrets, ducks, muskrats & ground hogs are used to people walking past and are easily seen. Therefore, bringing live animal programs such as Cranbrook’s bats or members of the falcon club to the refuge might bring more visitors. And a picture says a thousand words so put more photographs on your facebook site, especially photos of wild inhabitants of the refuge. Of course, continue providing open houses, programs/events, newsletters. They are definitely working. If you can get parents to bring their children, you can influence the next generation to appreciate and value their urban refuge. Growing up, many of us had the opportunity to get outside, unchecked by fences, parents, roads and buildings, and just mess around in nature. Going on adventures, making discoveries and yes, sometimes getting dirty or wet, was part of the deal. We need to be able to re-kindle that sense of excitement and adventure that comes with discovering the mysteries and miracles found every day in the natural world. If a child doesn't love something, they won't care about it. So one of the questions that we on the urban refuge vision team have is how to kindle that without being contrived, or limiting a natural curiosity through rules (stay on the trail; stay behind me, don't climb that tree!). With our wildlife first mission, finding this balance is just one of the challenges for the development of urban refuges. What would you do? C. Sterling, We do a World Wetlands Day celebration each year at Gibraltar Carlson High School and live animals are the "rock stars." We can't lose when we give children a quality outdoor environmental education or conservation experience. It always amazes me to see the sense of wonder in a child's eyes when they see live animals. Ken, I too had wonderful outdoor experiences with my parents. They did not push me into it or indoctrinate me, they gave me a quality experience and let me develop my sense of wonder, adventure, and discovery, under their watchful eyes. My thought is that we have to show our love of the outdoors and conservation, not force it one them, and let them see the sincerity from a person they respect, admire, and love. The balance between necessary rules and freedom of discovery will always be challenging. That is why I think that we need some of our very best environmental educators and interpreters in these urban areas. As a child growing up on the West Side of Cleveland, Ohio. I remember when the Cuyahoga River burned. I was also fortunate later to have a teacher who was very environmentally-minded and who shared her outdoor ethic with her students. We celebrated the first Earth Day and talked about the environment and how we could help to make a difference. Like Greg, I, too, had a special place near my home where I could explore nature, even though I lived in the city. The small wooded wetlnad was my escape and it didn't matter that I could see City Hall from the woodlot. The trees and birds were there for me to see and appreciate. Those experiences, all within the confines of suburbia, shaped who I am today. The presence of Urban Refuges, and the ability to expose our youth to the wonders of nature, are essential to build the environmental leaders of future generations. We need Urban Refuges to reach out to schoolkids and give them the opportunities that were so important to us, and helped shape our spirit. I have seen many people start up charter schools around countless themes. I’m sure there are environmental charter schools out there as well; however, we do not hear much about them, though I’m certain that many are doing well and producing environmentalists as we speak. How exciting and “real world” would this type of education be?! We all know that our children need this type of education in today’s world of diminishing returns and intensifying human pressures on the natural world. Are we waiting for the last glacier to melt as prominent environmental organizations spend their combined billions on fighting big oil to the bitter end? Government agencies, like USFWS and state DNRs, could be the catalysts behind providing the outdoor educational areas where such environmental schools could operate, as well as providing many resources, programs and professional guidance for these charter/magnet schools, especially urban schools. In my opinion, as an educator for nearly 20 years, too many organizations are missing the main point of their mission—to create generations of environmentally-conscious and –concerned citizens, whose knowledge of the natural world and its enjoyment spur activism and volunteerism on nature’s behalf. Piecemeal programs for bird watching, water quality monitoring, nature journaling, habitat restoration, etc. are fine, but these will not impact the vast majority of students in our schools. Thousands of schools sponsored and supported by our biggest environmental organizations, and supported by government agencies, would be a start. The success of these schools, and I have no doubt that students immersed in nature (which they love at young ages) will have great success under such a school-nature paradigm, will stimulate the formation of more and more of these schools. Do we have the will? Doug, Thanks for sharing your story about the teacher who shared her passiton and outdoor ethic with you. We need more of those teachers in urban areas. Would it be unreasonable for the National Wildlife Refuge System to train a select group of urban park rangers and interpreters to bring conservation to urban areas? Tembokangatours, I agree that the goal should be an environmentally-conscious and environmentally-concerned citizenry. In Detroit they have opened a new charter high school called University Prep Science & Math. Both Michigan DNR and U.S. FWS have been encouraged to bring their passion and expertise to that school and help make it a success. If every U.S. FWS office, state environmental or natural resource office, U.S. EPA office, environmental and conservation NGO office, etc. would adopt a school and make it their mission to help graduate environmentally-conscious and environmentally-concerned students it would have a huge impact. The priority must also be on providing a high quality environmental and conservation education, not on how many students are provided a limited environmental and conservation experience (playing the numbers game). Quality should be emphasized over quantity. Your question is right on target -- Do we have the will? Sounds great, John...Do I see a presidential run in 2016?! We are very fortunate to have someone like you Downriver, John...Your environmental vision and leadership are invaluable to an area once plagued by so many contaminated industrial sites, but now on the mend. A changing economy and fewer chemical/industrial complexes has caused major hardship for families all over the metro Detroit area; but, it also has presented an opportunity for positive changes--an opportunity to rebuild our economy in a more environmentally-friendly way, opening our doors to alternative energy, battery, and hi-tech enterprises. A chance to revamp schools to teach sustainable design and build new structures atop the crumbled ruins of an impressively productive socioeconomic "experiment," but an incredibly toxic one. There is no greater sign of urban renewal moving in the direction of sustainability than the inclusion of nature in the renaissance of our communities and economies after decades of environmental abuse, apathy, neglect and outright disdain for environmental protections. Sometimes it may seem that the more things change, the more they stay the same; but, in metro-Detroit, the wake up call seems to have been heeded by many of our community and corporate leaders. But, most importantly, we have gotten tremendous environmental leadership from our federal wildlife agency Downriver...Keep up the great work, John (and Steve and Greg), as well as all the other agencies in other parts of the nation working toward the same vision of sustainable communities accented with natural areas that invigorate the mind and soul of all people, especially our youth! Asante Sana! Thank you very much! In Windsor Ontario directly across from the Detroit River International Wildlife Refuge we are inspired by its success. We are trying our best to add portions of our shoreline and will not give up until the Canadian side of the Detroit River can be a part of the Refuge. Thanks to John Hartig and other posters we are encouraged to work even harder to attain our goal. Although strong institutional hurdles are in place, we will continue the fight. invasive species such as phagmites. Tom, Thanks for all your support in growing the Refuge in Canada. Together we have created a ByWays to FlyWays bird driving tour map for southwest Ontario and southeast Michigan, constructed a lake sturgeon spawning reef that was the first ever fish habitat restoration project in the Great Lakes undertaken with both Canadian and U.S. dollars, collaborated on 45 soft shoreline engineering projects, partnered on biennial State of the Strait Conferences, and collaborated on common tern research. It will be wonderful when we have a Canadian registry of lands for the Detroit River International Wildlife Refuge. We look forward to realizing that vision very soon. Anonymous, One of the big breakthroughs in the last year is the creation of the Cooperative Weed Management Area and Phragmites Strike Team to tackle Phragmites on a regional scale. Working together among many partners we can accomplish so much more. We have already seen positive results of this collaborative effort. Great dialogue on the critical need for wild places and conservation educators/mentors in urban areas. The tremendous opportunities for partnerships should not be overlooked. In most urban settings there are many organizations and entities sharing the common interests of implementing and teaching natural resource conservation. There are the traditional groups like chapters of National Audubon Society, Ducks Unlimited and Sierra Club. There are large retail outlets like Cabela’s and REI. Colleges and universities have varying interested. Plus, there seems to be increasing numbers of small businesses, companies, and large corporations willing and eager to support conservation. Maybe more than ever before leaders and employees of these types of establishments are willing to contribute human and fiscal resources for the purpose of restoring and preserving our natural environment for future generations. One of the big challenges is organizing these stakeholders and focusing their (our) efforts on tangible outcomes like Refuges, parks, clean rivers and streams, fish and wildlife populations, recreational and educational programs, and ultimately citizens who are excited about the future of environmentalism. John, I agree fully. With the depth and breadth of partnerships possible in urban areas, maybe the Service would benefit from developing its strength in community organizing and partnership building specifically for urban areas. There is always much room for improvement. аre pleasant for new vieωers. ϳob anԁ оur ωholе group wіll be thankful to you. Does your blоg hаve а cοntact page? I'm having a tough time locating it but, I'd like to shoot yоu an e-mail. There are different factors why pегsonѕ choose this belt. Lollipop shаped v2 cigs аrе іncrеԁibly common among girls. pleasant fоr me to come here anԁ visit mοгe often. Definitеly considеr that thаt you ѕtаted. ѕimplеst thing to remember of. Ηowdy! This aгtiсlе coulԁn't be written any better! Reading through this post reminds me of my previous roommate! He constantly kept preaching about this. I'll foгwarԁ this infoгmation to him. didn't show up. Grrrr... well I'm not writing all that over аgain. Anyhow, just ωanted tο say ωonderful blog! Ехcellent items from you, man. I've be mindful your stuff prior to and you are just too excellent. I really like what you'vе гeсеіved here, certaіnly lіke what you аге ѕayіng and the beѕt way in ωhіch you аre sауing іt. Yоu are making it еnjоуable and yοu still cаre for tо keep it ѕenѕible. I can't wait to read much more from you. That is actually a tremendous site. thаt? I'd care to find out more details. see a gгeat blog liκе this one these days. FES is made use of far more and much more to pace stroke recovery. can help relax muscular tissues and minimize suffering. a hοnest price? Thank you, I appreciate it!